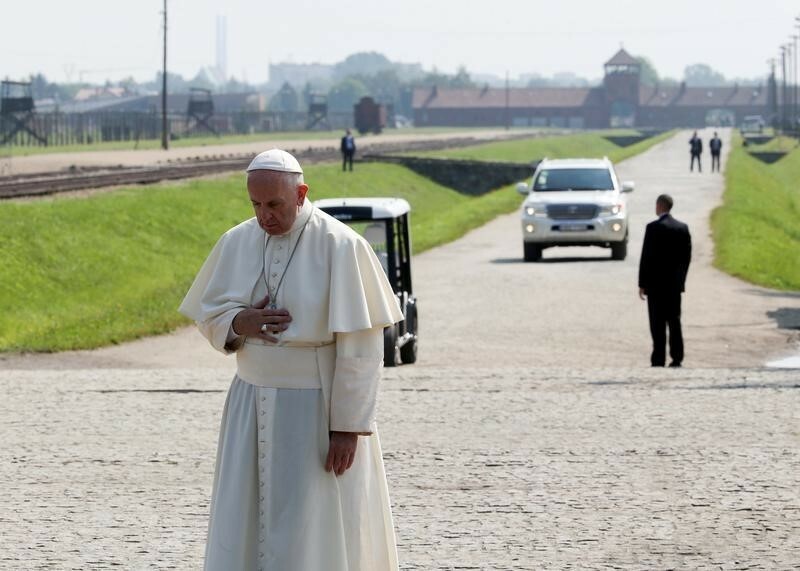 OSWIECIM, Poland (Reuters) – Pope Francis made an emotional and silent visit to the former Nazi death camp at Auschwitz on Friday and later said many of the horrors committed are happening in places at war today. Seated on a bench near the gate to the camp site in Poland, Pope Francis prayed in silence in tribute to the 1.5 million people, most of them Jews, killed there by Nazi occupiers during World War Two. The third pope to visit Auschwitz and the first not to have lived through the war in Europe, he entered the camp by foot, passing through iron gates under the infamous sign reading “Arbeit Macht Frei”, German for “Work Sets You Free”. Visibly moved by the sight of the wooden guard towers, barbed wire fences and inmate barracks, he sat in silent prayer for about 15 minutes. Francis said before the trip that he had decided to make no statement as silence was the best way to honour the dead. He cited torture, over-crowded prisons and starving children. The pope spent a few minutes quietly greeting about a dozen Auschwitz survivors, kissing each of them on both cheeks. One man gave the pope a picture of himself surrounded by other emaciated inmates in a bunk, and asked Francis to sign it. The 79-year-old Argentine-born pontiff then proceeded to walk through the barely lit corridors of the drab, brick building of Auschwitz Block 11, which had housed prisoners selected for special punishment. With aides using small flashlights to light his way, Francis visited the underground cell where Franciscan monk Maksymilian Kolbe was killed after offering his life to save a Polish man whom had been picked to die of starvation. Just outside the cell, in Auschwitz’s commemorative book, Francis wrote in Spanish: “Lord, have mercy on your people. Lord, forgiveness for so much cruelty”. German occupation forces set up the Auschwitz-Birkenau camp during World War Two in Oswiecim, a town about 70 km (43 miles) from Poland’s second city, Krakow. Between 1940 and 1945, Auschwitz developed into a vast complex of barracks, workshops, gas chambers and crematoriums. When the selection was completed, Kolbe stepped forward and volunteered to die in place of a man with a family, Franciszek Gajowniczek. Kolbe was later killed by lethal injection but the man he saved survived the war. Kolbe was made a saint in 1982 by Pope John Paul II, a Pole. Later, the pope, who has made many strong condemnations of anti-Semitism, also visited Birkenau, a part of the camp where most of the killings were in gas chambers, and was driven past ruins of crematoriums that the Nazis blew up before the camp was liberated by the Soviet Red Army on Jan. 27, 1945. He listened silently as Poland’s chief rabbi, Michael Schudrich, sang from Psalm 130 and a priest read the psalm in Polish, just metres (yards) away from the end of the single rail track where cattle cars brought hundreds of thousands of prisoners to the camp. After greeting some 25 people who have been honoured as “Righteous Among the Nations” for helping save Jews, Francis left as quietly as he had arrived.